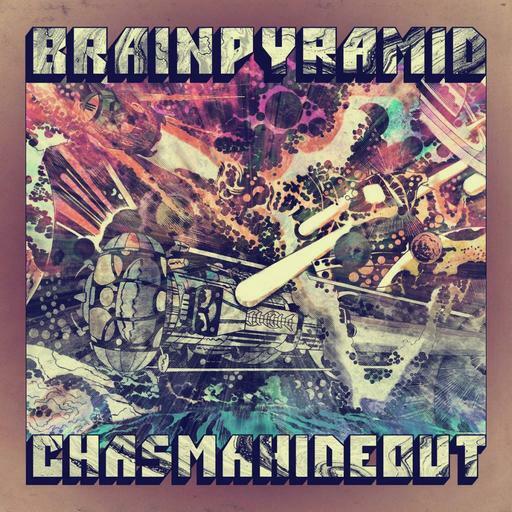 Brain Pyramid are the French trio of Gaston Lainé on guitar and vocals, Baptiste Gautier-Lorenzo on drums, and Ronan Grall on bass. The band formed in 2012 with a shared passion for classic heavy rockers like Led Zeppelin, Hendrix, Black Sabbath and Blue Cheer, but also contemporary stoner rockers like Kyuss, Nebula, Earthless and Orange Goblin. Chasma Hideout is their first full length album. Brain Pyramid synthesize their influences into a tightly wound Hard Psych Rock whole, but (like Earthless) can get far more spaced out than any of their predecessors. The opening song, Living In The Outer Space, consists of Hendrix via Kingston Wall Hard Psych that blasts off into space. Lazy is a similarly Hendrix inspired tune with a blazing jam finale and monster guitar solo. Landing On The Pyramid is nicely stoned and acidically spaced out. Lucifer is a little different, being a hauntingly stoned slab of Sabbath with synths Space-Doom. I love how the music alternates between wading through sludge with alien insects swarming around, before launching full tilt into a classic Sabbath rocking jam with the aliens hot on their heels. Twin Headed Giant is a high energy blend of spaced out funky swinging Psych and steamroller Rock. This is another one that reminds me of Kinston Wall. Into The Lightspeed features foot stompin’, balls to the walls blazing heavy Space-Psych-Rock. The organ is a nice touch too. The 11 minute title track closes the set and is pure space journey. It lays down a steady throbbing mind-melt vibe, with liquid Psych guitar, soundscape leads, sitar-ish drones, and leads that recall Ax Genrich stretching out on the early Guru Guru albums. As a whole it’s like an advert for steadily grooving, atmospheric, intergalactic Stoner-Space travel. Damn, these guys rock hard and are tight as a knot with mercury bursting levels of energy. And the cosmic edge is a treat too. 70s Hard Psych Rock fans will pop-eyed drool over Lainé’s guitar work, which shine’s all the brighter against the solidly anchored rhythm section of Grall and Gautier-Lorenzo.